People can not imagine IPL teams without Brand Ambassadors, who promotes teams not only in the grounds but also raise the value of their team. Brand Ambassadors always play vital role in IPL. The bigger the star is the greater prestige of team. Generally, opportunity to become brand ambassadors of any product and service is received by actresses, actors, sports players, singers and similar celebrities. In IPL this opportunity has been given to some bollywood personalities including Shah Rukh Khan, Shilpa Shetty, Deepika Padukone, Preity Zinta, and Katrina Kaif. Original Child Khiladi, Akshay Kumar is the brand ambassador of Delhi Daredevils. Delhi Daredevils has found a right ambassador as Akshay Kumar because he is from Delhi and very easily interacts with supporters. 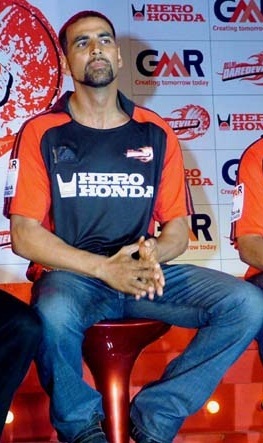 From the first season of IPL Akshay Kumar cheered team as brand ambassador. Delhi Daredevils team is owned by GMR group, a major infrastructure company in India. A well known film actress, Preity Zinta is co-owner and co-promoter of Kings XI Punjab. She is promoting her team along with her partner Daler Mehndi who evokes the Punjabi spirit in the followers. She loves many sports like hockey and football from her college life. Now she does best for making her team popular. The Bangalore Royal Challengers is headed by Indian liquor baron and Rajya Sabha MP ‘Vijay Mallaya’. Bollywood actress Deepika Padukone led the team as brand ambassadors together with Sandalwood film stars Upendra and Ramya. Last year Katrina Kaif was brand ambassador of Royal Challengers team, but due to her busy schedule she quit the team. Kochi Tuskers Kerala is the new team of Indian premier league owned by Kochi Cricket Pvt Ltd. Kochi Team faced difficulty while selecting brand ambassadors of team, but after long waiting they got bollywood glamour stars, Salman Khan and Katrina Kaif as the brand Ambassadors for Kochi ipl team. Previously, Katrina was the brand ambassador of the RCB team. Bollywood celebrities Anil Kapoor, Saif Ali Khan, Kareena Kapoor and Hrithik Roshan are brand ambassadors of Mumbai Indians team. They are cheering teams during the tournaments. They bring an amazing appeal to the Mumbai Indians teams. They are becoming great supporters for teams in IPL season 4. Saina Nehwal, player of Indian Khel Ratna badminton was selected as brand ambassador of Deccan Chargers in 2008. With her fantastic game-play, she has moved on to rule the roost, so this time she is encouraging the players very well. Rajasthan Royals team is owned by Shilpa Shetty, so do you think team needs any other brand ambassador? Shetty is best choice for Rajasthan Royals as brand ambassador. She is promoting team together with Ila Arun, who is also the other brand ambassador of the team. 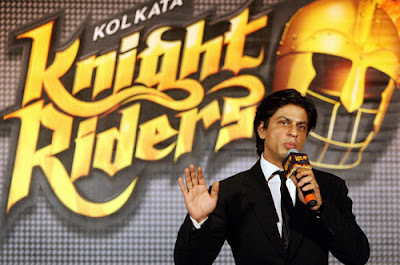 Kolkata Knight Riders is owned by the Juhi Chawla, Shahrukh Khan and Jai Mehta. Shahrukh Khan plays double roles for KKR. He encourages the team with some famous bollywood celebs including Farah Khan, Arjun Rampal, Sajid and Juhi Chawla. He is always ready to do whatever he can for his team to remain at the top position in the popularity list. Shahrukh and his team cheer KKR team throughout the match. IPL’s best team, Chennai Super Kings has not selected any bollywood personality for brand ambassador of team. Team selected South Stars like Vijay, Nayantara as brand ambassador. In first three season of IPL, Actor Srikkanth supported Chennai Super Kings team as brand ambassador but his contract was expired before current season.